Discussion in 'Releases' started by Afr0, Feb 12, 2015. This version doesn't really add any new features, it's just a stability update. Should hopefully make the city login process much smoother. 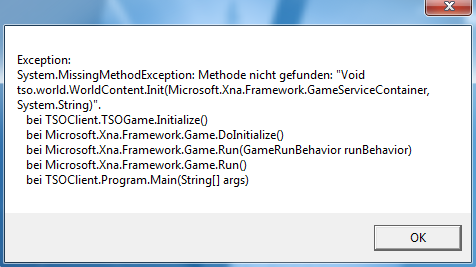 This is the first Monogame release, so you might need to install XNA 4.1 Redist. Also, you'll need to delete TSO.World.dll to avoid a crash! aidancheddar and liinor like this. You won't need XNA, but you will need OpenAL. Yes! Can't wait to throw XNA 3.1 out the window. On another note, maybe an updated installer for 0.1.26 with OpenAL is in order. Where is the download for OpenAL? Please let me know if your client is stuck in an endless loop while entering the city! I made it so the client should restart the authentication process if it fails, but I haven't had the chance to test the ramifications because the auth process only fails from time to time. I noticed there are no red lights or spotlights in the city view now ... did you remove them or am I missing something? They're now sent by the server! Ideally a good next step would be giving all of the players money and letting them purchase a lot - which obviously wouldn't go active until multiplayer but the lots would be reserved. Another option for testing would be waiting for the first online test, which should appear as a lot on the world map. If the purchasing system is in by then, then the lot can just be purchased to test on - otherwise it'll be a hardcoded pointer to a test simantics vm server. yoyo, aidancheddar and Marvin732 like this. I sended message to RainCloud and when my chatbox was minimized Raincloud gave me response then I sended new message and my client crashed. I used enter button both times. And I pressed blinking telephone to reopen chatmenu. I'm getting that same exception when doing nothing but switching from forums to game. Music stays playing until I close it out. Why we've got to delete every time anything ? When I try connecting it's stuck at 75% . I think we should pick a nicer city too. I've always liked charvatia for its colourful design and interesting landscape. xXJDrocks450Xx, liinor and RainCloud like this. Oh I just googled it ... Nice!